Sparkhouse offers a simple two page doc (below) to help you check-in with your mission and goals for faith formation. Best Sunday School Ever: 10 Simple Tactics to Engage Kids-Creating the best Sunday school ever. It’s gotta involve screens and lots of games and non-stop action, right? You might be surprised to find out that children respond even better to a few much simpler tactics. And they require almost no money! Keep Leaders Prioritized with this simple checklist. Staffing Your Children's Ministry -Written by Vernie Schorr and revised by Wes Haystead, this practical book for children's ministry leaders tells you how to accomplish your staffing goals without losing your focus on children. Part-Time Ministry Guidelines from the Southwestern Texas Synod. This resource is concise yet offers several options to consider based on context. Master of Arts in Public Leadership - (MAPL) trains those committed to making a difference in the world through public leadership. MAPL’s four core courses are drawn on the classic disciplines of theology, bible, history, and ethics, but are recast for the sake of leadership in the public realm. Students develop a professional emphasis with either the School of Social Work or the Fox School of Business at Temple University. Along with the coursework — the program immerses the student in hands-on experience with people and institutions nearest to the ground. The ELCA Youth Ministry Network Extravaganza - The Extravaganza is an annual 4-day conference that draws together anywhere from 500-750 adults who work with youth in congregations of the Evangelical Lutheran Church in America for the premier renewal, education and networking event of our church. ​The e-Formation Conference - e-Formation is a learning community and an ecumenical conference on ministry in a digital world. Intergenerate - InterGenerate is a conference designed for both practitioners and academics seeking to enhance life-long faith formation in religious communities. Senior pastors, professors, age-level ministers, sociologists, church consultants - anyone who seeks to better understand and develop lifelong discipleship practices will find something at InterGenerate. ​The Princeton Forum on Youth Ministry - The Princeton Forum on Youth Ministry is for youth ministers who are excited about new possibilities. International Association for the Study of Youth Ministry - Attend a conference out of town as you are strengthened with support for your vital youth ministry. 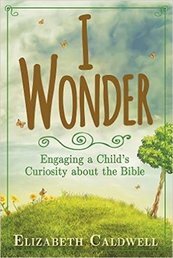 I Wonder: Engaging a Child's Curiosity about the Bible by Elizabeth Caldwell -​Not all children's Bibles are created equal. In an effort to have big print and big pictures, not every story in the Bible can fit. Ever wonder how and why certain stories are chosen for children's Bibles and what impact that has on our children? Learn what different children's Bibles have to offer. Making a Home for Faith: Nurturing the Spiritual Life of Your Children by Elizabeth Caldwell - ​The revised and updated edition of this classic Christian family resource that shows families how to articulate their faith features a new chapter six. It takes into account the growing number of blended families in the U.S., and discusses multi-faith and multi-cultural families and the challenges they face. Parents, guardians, and those who do ministry with children will benefit from this book. Real Kids, Real Faith by Karen Marie Yust - ​Drawn from a three-year study of children’s spirituality, as well as the best in theological tradition and literature, Real Kids, Real Faith provides insight and a variety of helpful tips for nurturing children’s spiritual and religious formation. Yust challenges the prevailing notion that children are unable to grasp religious concepts and encourages parents to recognize children as capable of authentic faith. ELCA Youth Ministry Placement - Links to job postings via the ELCA Youth Ministry Network.